Is a concrete or fiberglass pool better for me? Concrete pools cost $50,000 or more and require expensive long-term maintenance. They're highly customizable but take 3–6 months to install. 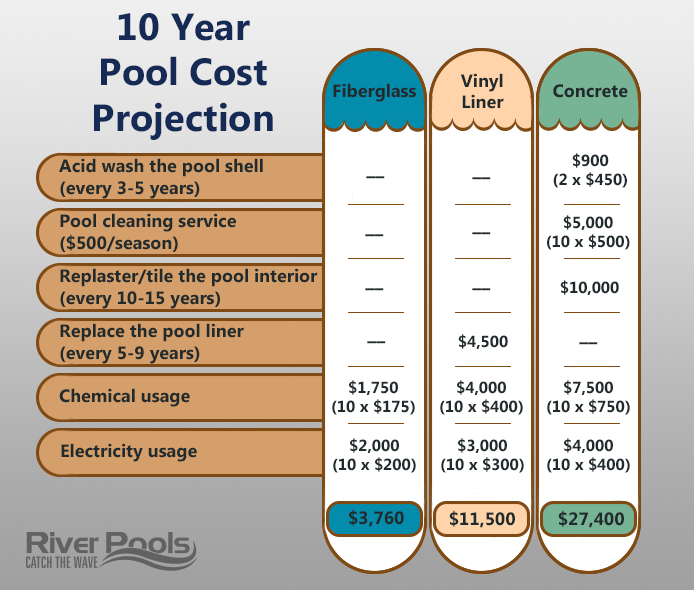 Fiberglass pools typically cost $45,000 or more and require little maintenance. They're pre-built on existing molds and only take 3–6 weeks to install. Although we don’t recommend DIY-ing a fiberglass pool, some people do choose to install the pool themselves, which can cost between $12,000–$30,000, depending on the pool size and any upgrades. Most fiberglass pool projects cost $45,000–$85,000 for both manufacturing and installation, but they can be much more depending on how fancy you get with landscaping, accessories, and water features. Long-term, your only serious maintenance expenses will be in chemicals and electricity. You’ll spend almost $4,000 over a 10-year period. Concrete pool construction usually costs between $50,000 and $100,000 upfront. Concrete pools need a lot of TLC to stay in good condition, so you’ll also need to budget for long-term maintenance such as acid washing, refinishing, and energy usage. Over the life of a concrete pool, maintenance costs over $25,000 every 10 years because of the extensive upkeep. Fiberglass pools typically run up to 16 feet wide, 40 feet long, and 8.5 feet deep. They’re created from pre-designed molds, so you’re limited to the established shapes and sizes. 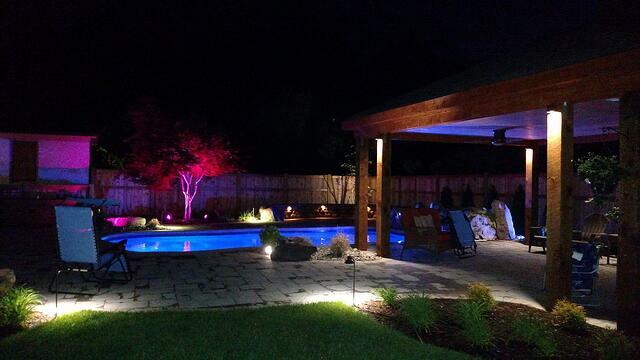 Even outside of the size restrictions, you can customize your pool to any aesthetic with water features, tanning ledges, tiles, and colorful lights and finishes. If you need a super long or deep pool, concrete is your best option. It costs more for each square foot, of course, but you can design your pool to look as dramatic as you like. You also have more freedom to design it to suit your specific needs. We manufacture the fiberglass pool shell off site. After we transport the pool to your backyard, it’s in the ground and ready for swimming in about 2 days. The patio and decking will take another week or two. From beginning to end, the process usually takes 3–5 weeks. It takes 3–6 months to construct a concrete pool. That is a long time for you to want to cry every time you look at your torn-up backyard. Plaster is the roughest interior surface for concrete; it scrapes your skin badly. Exposed aggregate (like pebbles) isn’t quite so rough, but the hard bumps can hurt to walk on. Polished aggregate can remedy that. Tile is the smoothest finish, but also the most expensive. 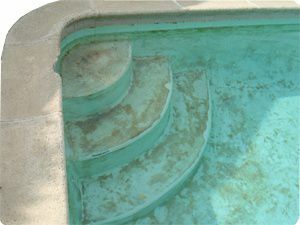 Both the gelcoat finish and the pool structure itself are super durable. You can also use a salt chlorine generator for low maintenance and silkier water, as the salt has no harmful effect on the fiberglass shell. The structure of a concrete pool—that is, the actual concrete—is incredibly durable. All interior finishes for concrete pools, including basic plaster, are strong enough that you don’t have to worry about damage from toys, dogs, or tree branches. 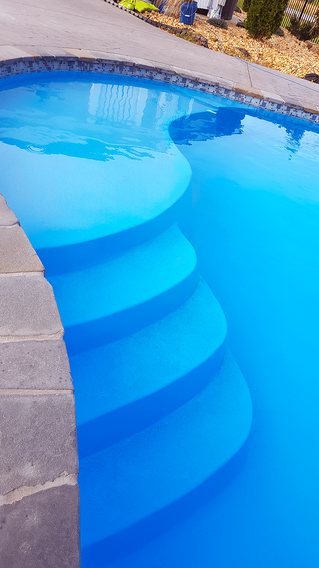 However, you do still need to replaster the pool every 10–15 years, including replacing the waterline tile. If you use a salt chlorine generator, the dissolved salt in the water will further shorten the life expectancy of a plaster-based interior finish (which includes aggregate). Salt water doesn’t affect a tile finish, though. The gelcoat also doesn’t affect the water pH, so you rarely have to add in acid to balance it. You do still need to test your water chemistry each week, though. The alkalinity of concrete increases the water pH, so you need to add muriatic acid (hydrochloric acid) every day. You also need to clean the entire surface of the pool with a steel brush at least once a week to remove any surface algae. The gelcoat of a fiberglass pool is smooth and algae-resistant, with only microscopic pores, so algae has no opportunity to burrow into it. Concrete has many pores and cavities, which invites algae. You need to brush the pool at least once a week. Fiberglass pools need less electricity and fewer chemicals to stay in good shape. Less money, time, and sweat. Nice! You have to put aside time and money to buy and add the extra chemicals to kill algae. Aside from that, you also need to add acid regularly to keep the water chemistry in balance, given that concrete is alkaline-based. Only you know your priorities for your new pool. Consider these different characteristics to consider as you determine the best fit for you and your family. Maybe the pool needs to fit your specific aesthetic regardless of cost. Or maybe you’d prefer low costs over customization. 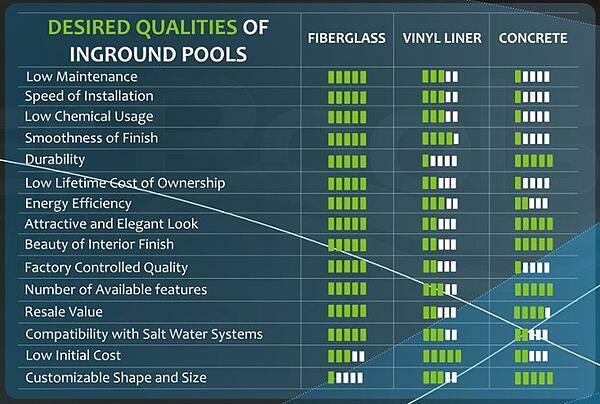 Unlike concrete pools, fiberglass pools are installed quickly (over a few weeks instead of months), cost much less in the long run, and require minimal maintenance and repairs. Fun fact: If you already have a concrete pool and want to switch over, you can actually install a fiberglass unit inside it. At River Pools we offer both freeform and linear fiberglass pools in Virginia and southern Maryland (and across the country through our dealers). If you think a fiberglass pool might be the right choice for you, we want to answer any questions you have!